We sweep chimneys & reduce fire hazards. We can repair your chimney, inside & out. We can brighten any space with a beautiful new appliance. We Are The Permanent Solution With Premium Products! With over 24 years of experience serving those in the Baltimore area, ChimneyTEK is bringing our excellent chimney, masonry, and ventilation services to Dover and the surrounding Delaware areas. As a family owned business, we treat each client with respect and each project as if it were one of our own. We stress the importance of operating with honesty and integrity to ensure the happiness of our customers, and our team is committed to customer satisfaction and safety. We provide a combination of knowledge, experience, and customer service that is unmatched, and can guarantee your satisfaction upon completion. Each member of our staff undergoes rigorous training and must pass annual certifications to provide the top-tier service ChimneyTEK is known for. All technicians are professionally certified by the Chimney Safety Institute of America. Therefore, they are knowledgeable about all types of chimneys and are equipped to handle any chimney, fireplace, or hearth repair job. In addition, they have National Fireplace Institute certification as gas hearth appliance specialists. We are also members of the National Chimney Sweep Guild. We use the knowledge gained through annual examinations and certifications to provide top-notch service to our neighbors throughout Kent County. Don’t wait any longer — give us a call today at 302-729-6112! You can count on our team for it all! We guarantee mess-free, prompt service, and we aim for 100% customer satisfaction every time. No matter what your needs may be, our highly educated and trained team is here to meet those needs so you can enjoy a safer, more comfortable home and fireside. Although we’ve traditionally only served the greater Baltimore area, ChimneyTEK is expanding up I-95 North to the Delaware area. 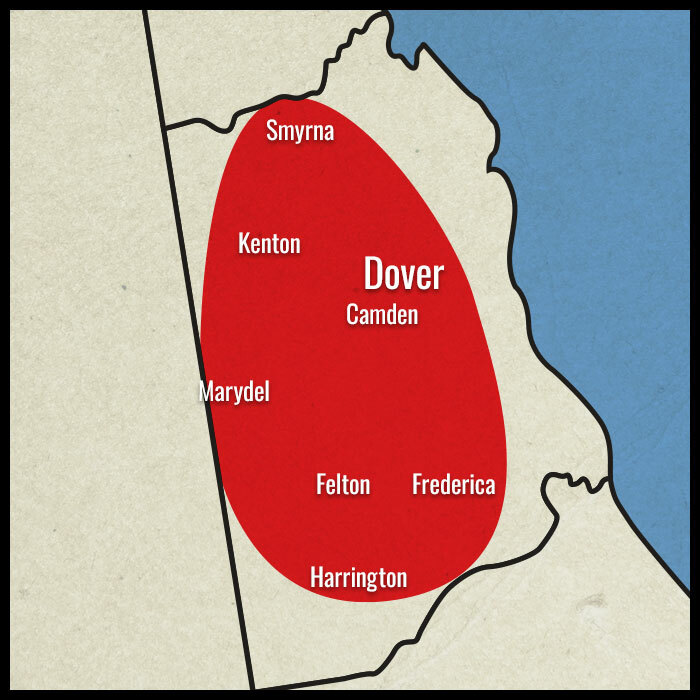 We proudly serve areas all throughout Kent County, DE. Check out our complete list of Delaware service areas here! If you are in the Dover, DE area and in need of chimney, ventilation, or masonry services, give us a call today at 302-729-6112 or click here to request an appointment online. Our team is committed to providing you with top-notch services and products so you can safely and efficiently enjoy your fireplace! We can’t wait to hear from you! In the meantime, check our out comprehensive services and appliances to see what best fits your needs! ChimneyTEK provides the best in chimney and fireplace services to all our customers throughout the Dover and Kent county area.